Finding backlink opportunities for your website is not that easy. Before you see a single page or website that fits your link building standards, it might take you three or five minutes – not to mention if you are in a very specific industry, i.e. orthodontics. 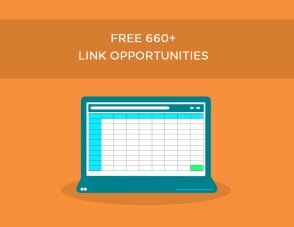 We’ve compiled a huge list of 620+ backlink opportunities from different industries like finance, business, writing and parenting. Enter your email below to get a FREE and EXCLUSIVE access to our database.